The airport experience can occasionally be the worst part of traveling. Sometimes you are powerless when it comes to how and when you get to your destination. You are at the mercy of weather, layovers, and air traffic control. It would be nice to feel some sort of control over your travel plans. One way that this can be achieved is by packing healthy meals and snacks ahead of time, providing you with the tools to combat those tempting terminals. Killing time in an airport can wreak havoc on anyone’s well-intention of eating healthy. I am here to help by suggesting some important nutrients, sharing my personal go-to travel snacks, and providing an easy recipe that will make it through security. When it comes to packing your snack bag, there are a few specific nutrients that you should consider to ensure healthy travel. First, and foremost, hydration while flying is very important. The air on a plane is quite low in humidity, resulting in scratchy throats and an increased risk of getting sick.1 So bring a refillable water bottle and drink plenty of water before, during, and after a flight. Second, be sure to pack snacks containing complex carbohydrates and protein. These nutrients will keep you fuller for longer periods of time.2 Some examples include whole fruits, granola, nuts, and cheese. Lastly, consider low-fat options that won’t weigh you down. Steer clear of greasy chips, fatty meats, and desserts that will make your flight even more uncomfortable than it already is. Not all foods travel well. Consider refrigeration, utensils, and odor when packing your plane picnic. If you bring foods that spoil quickly, then you have a shorter window to consume them. Alternatively, you could utilize a gel ice pack, which is permitted by TSA if it is frozen solid when going through security.3 Try to bring items that do not require your whole kitchen utensil drawer in order to eat them. You want snacks that are easy to eat on the go. Lastly, please be mindful of your seatmates and do not bring offensive smelling foods on the plane. This list includes, but is not limited to, tuna salad, broccoli, eggs, cabbage, and chili. Now that you know which nutrients and considerations you should incorporate and stay away from, I would like to share my go-to travel foods. When I really get to plan ahead, I like to bring a hearty salad that I made at home. I find that if you take the time to actually make your food, you are more likely to eat it than let it go to waste. This recipe can include any number of combinations from your pantry or refrigerator, feel free to make it your own. Just be sure to include those sources of complex carbohydrates and protein to keep you satisfied during your lengthy travel. Mix salad ingredients together before leaving for the airport. As you can see, there is plenty of room to play around with this recipe to accommodate your tastes. Feel free to add additional vegetables that need to be used up before you leave town. The vinaigrette can be made ahead of time by whisking together all of the ingredients, adding the olive oil last. Keep the dressing separate from the salad until you are ready to eat it so that the contents do not become soggy. I hope that these tips and tricks satisfy the planner in you to take charge of your diet during your next adventure. 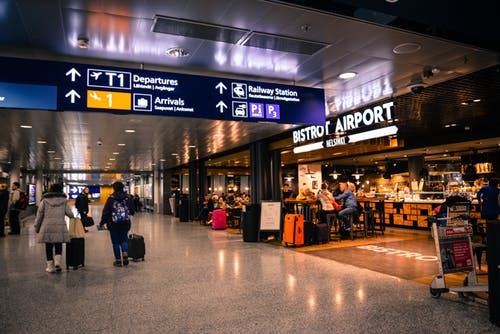 If you are not the planning type or happen to run out of healthy fuel, have no fear, read Part I here to make the best decisions at the various airport food stations. Remember, just because you are stuck in an airport, doesn’t mean you are stuck eating poorly. Bon Voyage! For more articles like this or part on of Eating Healthy in the Airport check out our Fill Your Plate Blog. Wondering what produce is in season. Check out the Arizona Produce in Season section. 5 Things to Know Before You Fly. (2017). Retrieved from https://www.pennmedicine.org/updates/blogs/health-and-wellness/2017/july/health-risks-of-flying. What Can I Bring? (n.d.) Retrieved March 5, 2019, from https://www.tsa.gov/travel/security-screening/whatcanibring/items/gel-ice-packs. This entry was posted in Cooking, Diet Tips, Fill Your Plate, Food, Fruit, Grocery, Health Tips, Healthy Eating, In Season, In the Kitchen, Produce, Recipes, Water and tagged Airport eating, Healthy Eating, Healthy on the go, Part two, Salad on the go, travel. Bookmark the permalink.